Reiki literally translates as 'spiritual energy'. Reiki is a universal energy, it is around us, within us and available to us at any time. Reiki is also used to describe a Japanese energy healing system developed by Mikao Usui. Today most of us encounter Reiki as a hands-on healing system. We can recieve a Reiki treatment from a practitioner, take a course and engage in practice, we can get attuned/certified by a teacher and offer it to people. I originally got exposed to Reiki from my massuese. I loved it. Then I got curious about it. My formal training was with Libby Barnett. I took my level 1 and 2 certification with her in 2009. We were taught how to tune in to the feeling of Reiki and how to offer it to others. The general understanding of how we give Reiki to another person is that we are conduits for the flow of Reiki and it moves from our hands into the recipient. There are various hand positions, hands are either on or off the patient. The hand positions are related to chakras (energy centers in our bodies). The recipients body uses the energy to heal or support whatever it needs. After my course I began to extrapolate what I had learned on to animals. Because animals are different than people and need a different approach I began my search for animal specific Reiki teachers. I met my second Reiki teacher was Kathleen Prasad. She did a 3 hour lecture series at the American Holistic Veterinarian Medical Association conference in 2010. She has published several books and has an organization that promotes Reiki in shelter situations (SARA). What I learned from her changed my approach and mindset to my Reiki practice for myself and animals. Kathleens' approach to animals is softer. It is a meditation practice and an offering of Reiki verses a more focused intention or strong willed 'here, I am giving you Reiki' approach. Her approach makes a lot of sense to me, more animal friendly. It is generally accepted that animals are more sensitive to energy than people are. Because of that we shouldn't force it on them. Animals are very honest and pure in intention. They tell us if they are willing to receive it or not. There is also no placebo effect with animals. While you are practicing a Reiki meditation an animal will chose if they want to participate or not. They choose how close they want to be to you--they may want to be in your lap, or sit next to you or be on the other side of the room facing away from you. We don't impose the hand positions on them that we learned in the human course. The animals' Reiki experience is on their terms. Because animals chose to receive Reiki or not , and because we are not in control of the outcome, we learn humility and detachment. We aren't in control of how the animals body will use Reiki, we can't deliberately focus Reiki onto a disease or organ system, nor can we "will" the outcome we want for our pet or patient. The Reiki you offer will either affect change or not. It's been years since my exploration into Reiki. I still practice the meditations I learned from Kathleen and I still offer Reiki to my patients and pets. Sometimes I offer Reiki to my surgery patients by holding my hand over their incision, or placing my hands over their abdomens or in a classical cranio-sacral position. Some times after a long exhausting day and we have an animal that will be spending the night with us I go into their cage and offer Reiki. Sometimes I feel them drawing energy into them, and sometimes I feel them giving me Reiki. 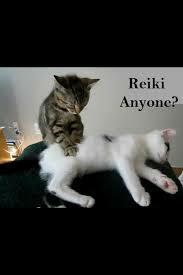 Yes!, there are Reiki animals--natural conduits for the flow of this energy. Perhaps you have have felt this yourself.